Golden Tee Live 2018 - Lucky Coin Inc.
Lucky Coin is excited about the Golden Tee Live 2018 game and the New Golden Tee Live 2018 features! The 2018 version of Golden Tee Live offers new locations and great courses as you can from the preview below, and this is one of the most exciting version of the legendary pay-to-play video golf game. Avid video golfers compete on incredible fantasy courses, with friends or head-to-head in a wide variety of skill contest formats. Play for fun, play for glory or play for big cash prizes! 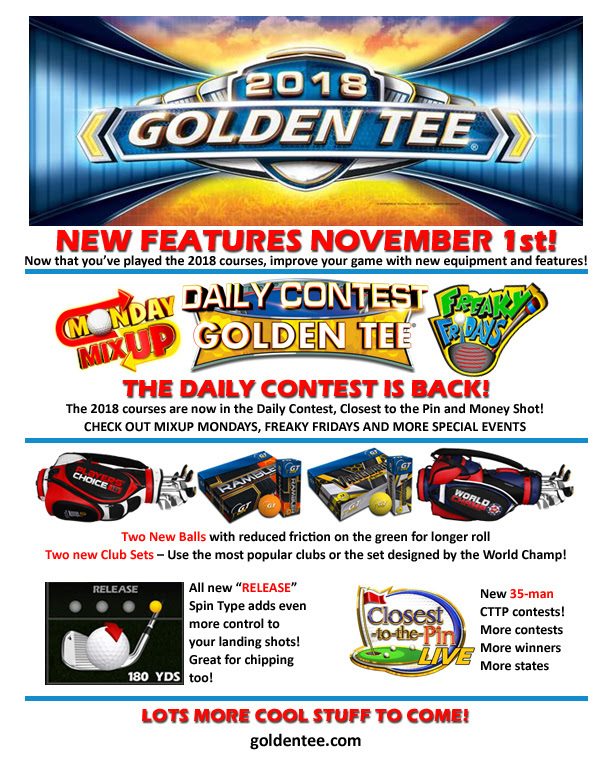 The new Golden Tee Live 2018 features include Monday Mixup, Freaky Fridays, Daily Contest, 35-man Closest to the Pin, 2 new balls, 2 new club sets, and an all new “Release” feature to help with spin on your landing shots. If you are interested in working with Lucky Coin, you can contact us at info@luckycoininc.com, call us at 1-855-34-LUCKY. We provide the equipment, installation, maintenance, and exceptional 24/7 service FREE of charge, and you simply benefit from the added income! It’s a Win, Win!